If your decking has turned grey or looks so weathered that cleaning the surface just won’t do the trick any longer, you will need to consider restoring your boards. In this guide our experts take you through the various options open to you for restoration & help return a tired deck to looking like new. Section 2: What Are The Best Decking Restorer Products? Section 4: What Is The Best Sander For Garden Decking? You will need to decide upon the best option for you based on the age and condition of your decking. Probably the most popular option for those restoring their boards, manufacturers offer restoring products which are specially created to breathe life into an aging deck. Note that this option is only suitable for wooden structures – wood-plastic composite & PVC decking is generally capped, meaning the boards cannot absorb the restoring product. When using a restorer on your wood deck, you should always focus on small manageable areas of your surface – roughly 3 or 4 boards at a time; moving from one area to another. First, use a hard-wire brush to remove any organic matter, dirt or debris from the surface of your deck. You could also use a pressure-washer provided this has a wide fan jet and less than 1300psi of pressure. Remove any existing capping, stain or preservative using white spirit – leaving the surface clear for your restorer. Once dry, you should begin to apply your chosen restorer product to your boards using a brush. After application, massage the restorer into the wood using a wire scrubbing pad or brush. Work carefully from one small area to another, leaving it to stand for a few hours. Next, use a garden hose to fully rinse your surface, washing away all of the residue. Allow 2-3 days for your decking to completely dry out before applying a protective finish. And that’s it! Your deck should now look good as new. There are limited options available when it comes to restorer products on the market. This is because most people choose to sand their surface rather than salvage the existing one. However, there are certainly benefits to using a restorer – for one it is much less hassle and requires much less effort than sanding. It’s also usually cheaper, though it definitely won’t last as long. If you decide that this is the best option for you, then you’ll most probably choose Ronseal, as it’s pretty much the only option on the market. In all honesty we’ve had mixed experiences with this product and you should take this into consideration before buying. All our experts agreed that of the different products we’ve used over the years, this one is the best we’ve come across. We always use it before re-staining our decking and it seems to make it last so much longer. Many people have reported that it does the job – at least with plenty of scrubbing! If you’re just looking to return a bit of colour to a deck that has turned slightly grey, then you’ll probably be happy with the results. If your deck is very old & weathered then you should probably skip this and move straight on to sanding the surface, as this product probably won’t be of much use to you. Remember: this product strips the wood of any existing oil or protection – so you need to protect it again with fresh decking oil after application! Many people leave negative feedback because they don’t realise this and after 6 months their deck looks incredibly weathered because it has no protective coating left & has been left open to the elements. Sanding your deck surface is only really an option if you don’t have decking boards which are grooved. This is because the sanding of grooved boards won’t remove the finish from the grooves. First clean your deck surface using the steps detailed in our guide. Hire an orbital sander and enough sandpaper needed for the size of your deck. If your deck is very weathered and needs a lot of sanding, start with rough 40 to 60-grit sandpaper. If you’re looking to smooth your boards or remove small imperfections, an 80 to 120-grit paper should do the job nicely without being too abrasive. Sand the boards using the orbital sander. The use of a palm sander is recommended for the corners and any other areas where sanding with the machine proves difficult. Any balustrading will also need palm sanding. Use a vacuum or leaf blower to remove any fine particles of dust and timber particles. The deck will need finishing as any previous finish will have been removed in the sanding process. 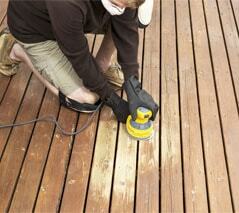 For the best look, the new staining product or decking oil should be applied as soon as possible after sanding. FAQ: Can I Use a Flooring Drum Sander on my Garden Decking? These machines should never be used for sanding a garden deck. They are very aggressive and can gouge into softwood decking boards, ruining the surface. When it comes to sanding your decking surface, we would always recommend an orbital sander, rather than a belt sander or flooring drum sander which might be to abrasive & chew up your surface. Our experts love the Bosch PEX 400 AE Sander because it’s so ideally suited to working with decking. It has a powerful 350W motor – so it really does get to work on your deck surface quickly! You do need to be careful that you’re not overly abrasive on your surface so we advise using the variable speed controls to find the ideal setting. With 6 different speeds you’re guaranteed to find one suited to your job. This also applies with your sanding paper – generally we’d advise testing between variable levels of grit depending on just how weathered your surface has become. The main reason we recommend this model over others is because of how comfortable it makes sanding. It’s relatively small but powerful when compared to similar tools –and the sleek design, low weight & optimal shape makes it so easy to use. When you’re on your hands & knees for hours, this really is so important. It’s tiring work and less effective sanders can turn a fairly simple job into a nightmare. Even at high speed settings the sander doesn’t seem to vibrate too much, it’s quiet and the integrated dust extractor also means that you’re working with a clear surface at all times. So what are the downsides? One annoying niggle with the Bosch PEX 400 AE is the sanding box – it does tend to fill very quickly and will clog when it needs emptying. While frustrating, this can be overcome if it is emptied frequently. In terms of the cost – this product is definitely more expensive than other orbital sanders on the market. But in this case, you definitely get what you pay for. For optimal performance we’d definitely recommend using the official Bosch sanding discs if you can afford to part with the extra cash – they’ll definitely help make your life a whole lot easier! As is stated above – you should be looking at variations between 40-120grit. Replacing your decking boards is the final option if your existing surface can’t be restored using a product or by sanding. First, establish which boards you need remove. Follow the nails to understand where joists under the surface are positioned. Make a cut into the sections of any boards which need to be removed. Remove the existing nails from the sections or full boards which you are looking to replace. A cat’s paw & hammer are ideal tools for this. Drive a cat’s paw into the wood underneath the nail; pulling back on the handle to remove it from the wood. If any of the nails are difficult to access, use a saw to cut through the nails between the boards and the deck frame. Next, take out the damaged timber and measure a new piece of wood to fill the gap left by the removal of your board. You will likely need to use a saw to cut this to size. Mark out where your nails will fit to the existing frame, then pre-drill holes into the timber so that you avoid any splitting of the wood from hammering them straight into the boards. Finally, attach the new decking board(s) in place, using galvanised decking nails. And that’s it. Note that you will need to use the same oil or staining product on your new boards as the old ones, so that they are not made to look odd and out of place. You will need to use the same species of wood if you’d like your new & old boards to match. If your decking has been built using pressure-treated timber, it’s likely to be very resistant to rot. This is especially true if it has been rated ok for ground contact. Most hardwoods are also naturally resistant to rot, while owners of composite & PVC structures generally needn’t worry about the impact of rot. However if your structure is built from wood as most will be (either in the framing, balustrading or boards), then it will be susceptible to rot. Any wood kept in the wrong condition for too long will eventually succumb to rot – especially timber which is kept in wet conditions for prolonged periods. You should inspect your deck regularly for any signs of rot in both the frame and the boards. We’d recommend doing this as part of your regular cleaning schedule. Take plenty of time to examine your boards and framing carefully, checking for any signs of darkening of the wood. Rot will often accumulate in hard-to-reach areas of your deck, such as the underside of your deck boards or the ledger between the framing and the house. Checking these areas will give you a thorough diagnosis & help you to recognise any early warning signs. Top Tip: if possible, crawling underneath your deck will allow you to check both the underside of your boards, as well as any timber which is in direct contact with the wet ground such as your support posts. It will also allow you to understand how the joists are holding up and if there are any signs of rot or damage which are likely to affect the rigidity of your structure. If you do notice that rot has begun to take hold, generally you won’t need to take any action unless it has reached a depth of more than 1.5cm. The treatment of rot is fairly severe and the only real course of action is to completely replace any parts which are affected. If the rot hasn’t found its way too deep into the timber, its growth can be slowed by taking preventative measures to keep the wood drier than its current environment. If the rot has reached to a depth of more than 1.5cm, it’s generally recommended that you should look to replace this part of your frame or decking board as soon as possible. A pry bar can be used to remove rotting boards or other parts; these should be replaced with rot-resistant timber. Where nails or boards are falling loose, don’t hammer these back into your structure. Instead you should look to use new, longer & galvanised nails in their place.